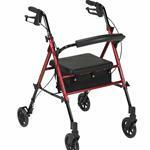 Deluxe Rollator with 8" wheels, curved backrest, padded seat and basket, 300 lbs maximum weight capacity. All of the features of the I-Class™ Dual-Release Walker plus 3" wheel attachments and glide tips for maximum maneuverability. Limited lifetime warranty.